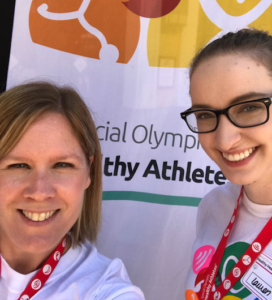 This past weekend, I and one of our fourth-year Doctor of Audiology graduate students, Lauren Benoit, volunteered with Special Olympics Florida in Orlando, FLlorida. Audiologists from around the state and many first- and second-year graduate students screened hearing for participating athletes as part of the Healthy Athlete program. The Healthy Athlete program started in 1997 to provide no-cost health screenings to participating athletes in a fun environment. Currently there are eight areas athletes can participate in: Healthy Hearing, Fit Feet, Opening Eyes, Strong Minds, Special Smiles, Fun Fitness, Health Promotion and Med Fest. As part of the Healthy Hearing program, athletes have their ears looked in to check for wax or disease. They are screened using Otoacoustic Emissions, initially and then by tympanometry and tone screenings as needed. If they pass the first screening, they are finished. If they did not pass the initial screening, their ears are checked again and if they had significant wax, it was removed, and the athlete was screened again. If they still do no pass, they move on to the next stages of screening. Most usually pass at this phase. Should an athlete not pass and needs a referral to a local Audiologist or Ear, Nose and Throat physician, a coordinator passes that information on. If an athlete needs hearing aids and does not currently have the means to obtain them personally or through insurance, Special Olympics Florida will provide hearing aids. This past weekend Healthy Hearing volunteers screened 470 athletes; that’s 940 ears!! This weekend was amazing and rewarding. The athletes and their families are extremely appreciative and so much fun to work with. It is also a big year for Special Olympics, as they celebrate 50 years of inclusive sports participation. I can’t wait to go back in May.